Did tree-forming daisies evolve due to drought stress? Tree-forming daisies endemic to the Canary Islands and Madeira are more drought resistant than their non-woody, continental nephews from which they have evolved, a team of international scientists has found. This discovery, published today in the journal Functional Ecology, demonstrates that increased wood formation in plants is strongly linked to increased drought stress resistance, which has potential implications for many of the non-woody crops that will suffer from drought stress under the current climate-change predictions. The number of tree and shrub species on (sub)tropical oceanic islands is proportionally much higher compared to that of neighbouring continents. This phenomenon is caused by ‘insular woodiness’ and has been intensively investigated by Charles Darwin. 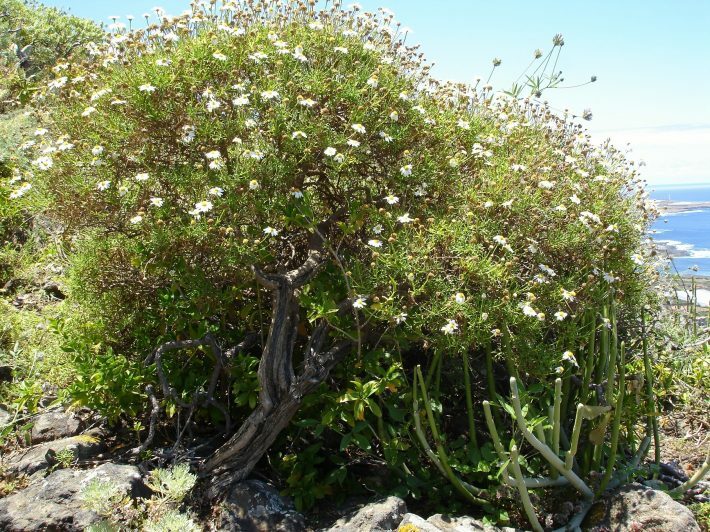 Darwin suggested that many of the insular species (shrubs and trees) that only grow on islands have evolved from non-woody, continental relatives. Current understanding of species relationships supports Darwin’s view that hundreds of non-woody lineages evolved independently into woody plants after colonisation on these islands, but scientists have not been able to work out why some plants become woody but not others. To tackle this long-standing question, researchers from the Naturalis Biodiversity Center (Netherlands), in collaboration with colleagues from the universities of Bordeaux and Clermont Auvergne (France), La Laguna (Tenerife, Canary Islands), and UNICAMP (São Paulo, Brazil), have studied differences in drought stress resistance amongst woody Canary Island species and their non-woody continental relatives. They, for the first time, present a link between insular woodiness and increased drought resistance, using stem anatomical observations and measuring water transport in plant stems under lab simulations of increasing levels of drought stress. These lab measurements estimate the spontaneous formation of air bubbles in the water conducting vessels when plants are facing drought stress in nature. Air bubbles can reach lethal levels, leading to a total blockage of the long-distance water transport in plants called hydraulic failure, which is one of the main causes for plant death under drought. The five insular woody Argyranthemum species studied have stems that are more adapted to withstand air bubble formation in vessels compared to stems of five herbaceous relatives. This observed variation in hydraulic failure can be functionally linked to fine-scale vessel characters, so-called pits that are essential in preventing air-entry in the vulnerable water transport pathway of plants. It is tempting to assume that drought has triggered wood formation in the daisy lineage. However, palaeoclimate data for the timeframe in which the insular woody Argyranthemum and the other 37 insular woody lineages have originated must first be reconstructed before a causal relationship between increased drought and increased woodiness can be fully supported. If this causal correlation could be convincingly demonstrated, scientists can proceed with cracking the genetic code for wood formation in every non-woody crop, such as strawberry, lettuce, potato, bean, pea and cucumber. “This would enable us to grow woodier, taller and above all more drought-resistant plants in light of a changing environment and the increasing human population which will require more food,” says Dr Frederic Lens from Naturalis Biodiversity Center.